Access Media 3, Inc. (AM3), a “triple-play” digital media services provider to multi-tenant residential, commercial, and multi-use properties, today announced the acquisition of the operating assets and contracts of inVision Networks of Burr Ridge, Illinois. Jordan Knauff & Company, an investment bank with offices in Chicago, Illinois, and Kansas City, Missouri, advised on the acquisition, which brings about 2,000 subscribers in 14 buildings to Access Media 3’s customer portfolio and extends the company’s reach to more than 10,000 subscribers in 130 buildings in the Midwest. The company’s current customers include many of the region’s largest and most-respected multi-unit property managers. For these customers and others, Access Media 3 has delivered customized end-to-end solutions designed to meet the unique requirements of each building. This tailored approach allows each property to offer flexible combinations of high-speed internet, TV, and voice services to residents at a reasonable price point. The purchase of inVision Networks marks the second completed transaction for AM3 in the past nine months. In September 2007, AM3 purchased the satellite assets from Tunnel Vision Technology, Inc. of Chicago, Illinois. 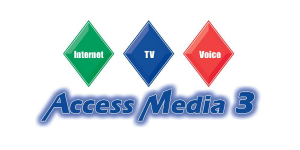 Access Media 3, Inc., headquartered in Willowbrook, Illinois, provides triple-play media services (satellite television, high-speed internet, and telephone) to multi-dwelling resident and commercial customers in the Midwest. With a current base of 10,000 subscribers, Access Media 3 is one of the Midwest’s largest non-franchised media providers. For more information about Access Media 3, Inc., you can visit www.am3inc.com or contact Scott Rediger at 630-230-0555.